It is important to know if a waterfront property you may consider purchasing is located in a flood zone. Lake County elevations are some of the highest in the State. 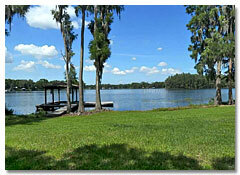 For this reason, It is rare to find a lakefront home or lot in the Golden Triangle area that requires flood insurance. However, it pays to be cautious and find out in advance. The major flood zones in our area are located around the shores of the St. John's River at the far east end of the County. This river is a major water drainage conduit for the entire north end of the State of Florida. It is common during periods of especially high water for boats on the St. John's River to be limited to idle speed to prevent their wakes from damaging private property. In order to determine if a property is in a flood zone, you need to have a survey conducted with an elevation certificate. These measurements will be included with the survey and used to determine the likelihood of your property being affected by a flood. The survey will also indicate the historic high water level and in the case of new construction, the County will use these indications to determine where you may locate your home. FEMA has defined flood hazard zones shown on the Flood Insurance Rate Maps. Under the law, federally regulated lenders must require borrowers with buildings that are located in these zones to purchase and maintain flood insurance. If you have questions about Florida Flood Zones, please contact us.